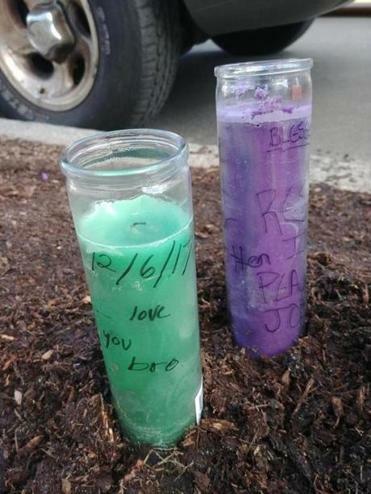 Memorial erected at scene of triple shooting. As Mission Hill grapples with another deadly shooting, community leaders will hold a meeting Monday to discuss violence that has rocked the neighborhood in recent months. The meeting at 6 p.m at the Tobin Community Center on Tremont Street will come less than a week after Wednesday’s triple shooting that killed a 20-year-old man and seriously injured two teenagers. “This was traumatic for our community,” said Alexandra Oliver-Davila, executive director of Sociedad Latina on Thursday. The triple shooting came just months after the shooting death of 58-year-old Andres Cruz, the popular owner of a hardware store, who was killed in July at his shop on Tremont Street. Sociedad Latina, Mission Hill Neighborhood Housing Services, and the community center are organizing the meeting. Boston police are expected to attend. “Obviously, it’s very sad and it’s a tragedy; someone was killed,” said Oliver-Davila. Her youth development organization is located a few blocks from the Tobin center, which is near where gunfire erupted Wednesday night. The shooting resulted in the death of a Roxbury man, who had not yet been identified by police Thursday night, Two other unidentified victims suffered gunshot wounds and are expected to survive, police said. No arrests had been made or charges filed as of Thursday night. The violence unfolded at about 7:45 p.m., Wednesday, just before a basketball game at the community center ended, and an estimated 200 youths poured out of the facility, according to police. There were possibly many witnesses to the shooting, Boston police Commissioner William B. Evans said. “As is the case with any death investigation, cooperation from anybody who may have been in the area at the time of the incident and may have seen something or knows something can make all the difference when it comes to solving these crimes,” Evans said in a statement. A makeshift memorial that included candles and white Nike sneakers was visible at the shooting scene Thursday afternoon. At the center Thursday evening, Ana Colon, 33, and a mother of three who lives near the Ruggles T stop, was picking up her 11-year-old daughter, Melani, from an after-school program. Colon said she was concerned about the ease with which people can get in and out of the community center, but wasn’t shocked by the violence. “There’s always a lot of trouble in this area, there’s a lot of shootings,” she said. Bill Owens, 80, a former state senator, who was picking up children of family friends at the center, was troubled by the slaying. “This is a place where a lot of young children come for recreational activities and that’s a horrible situation,” he said. “I just wish we would have better supervision of our children, and not have people carrying guns that could kill young people,” he said. Travis Andersen, Emily Sweeney, and Mike Bello of the Globe staff contributed to this report. Danny McDonald can be reached at daniel.mcdonald@globe.com. Follow him on Twitter @danny_mcdonald.